Cisco announced earlier today that they are in the process of developing an Android-powered tablet, dubbed Cius, for the business market. Cisco was careful to assert the tablet’s role as a tool for professional users, rather than a media-oriented consumer device. Clearly Cisco is attempting to get to the office before the iPad gains traction in this sector, and by the looks of the Cius, they may succeed. The mock-up of the device, shown below, is fairly interesting. It sports a 7” screen around a large bevel with a sizable external speaker (presumably for conferencing purposes). The standard Android hardware buttons, minus search, are featured below the screen. UPDATE: One of our readers was kind enough to provide us his hands on experience with the device, thanks @JimmyGadget ! 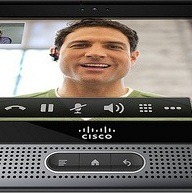 Certainly promising on paper, but only time will tell if Cisco is going to deliver. I would certainly be interested in getting my hands on one for web conferencing!